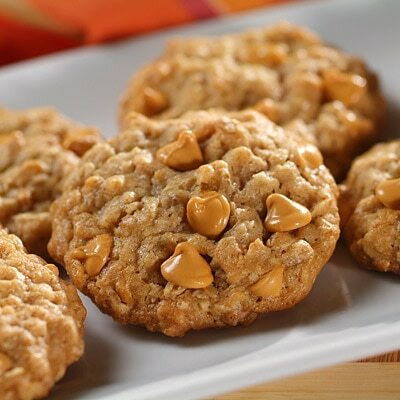 A winning combination: SPLENDA® and NESTLÉ® TOLL HOUSE® have teamed up to give you these Sensibly Delicious Oatmeal-Butterscotch Cookies. COMBINE flour, baking soda, cinnamon and salt in small bowl. Beat butter, SPLENDA® Sugar Blend for Baking, brown sugar, eggs and vanilla extract in large mixer bowl. Gradually beat in flour mixture. Stir in oats and morsels. Drop by rounded tablespoon onto ungreased baking sheets. BAKE for 7 to 8 minutes for chewy cookies or 9 to 10 minutes for crisp cookies. Cool on baking sheets for 2 minutes; remove to wire racks to cool completely. GREASE 15 x 10-inch jelly-roll pan. Prepare dough as above. Spread into prepared pan. Bake for 18 to 22 minutes or until very lightly browned. Cool completely in pan on wire rack. Makes 4 dozen bars. * NOTE: 3/4 cup SPLENDA® No Calorie Sweetner, Granular can be substituded for SPLENDA® Sugar Blend for Baking.